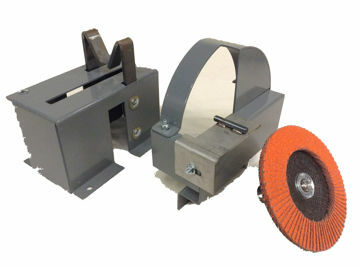 Sharpening blades has never been easier! With the RBG 712 Blade grinder, you can restore you blades back to a factory flat edge in no time at all! Just use our preset blade guide to maintain the proper angle for the best cut and edge life. Our unique design will allow you to grind any length of cutting edge required for both standard (right-hand) and reverse (left-hand) blades. Please note, this grinder is for FLAT BLADES ONLY, it can only sharpen mulch blades with OPTIONAL RBG712-50 Adapter! FREE GRIT COLLECTOR RBG 940 with this unit and keeps your shop cleaner and safer!! !